The atmosphere inside the venue was electric as soon as women arrived. Groups of friends came together, moms with daughters, sisters, professionals looking for a network, and many alone to find their tribe. Constant sounds of excited chatter and laughter filled the air while drinks and delicious food were enjoyed amidst it all. It’s always so interesting how we all connect so naturally as women. Contact details were quickly exchanged and women who minutes before were complete strangers, became fast friends! 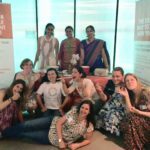 Making friends and feeling at home is only one aspect of what we are aiming to achieve…we are in essence about building a community for women by women. 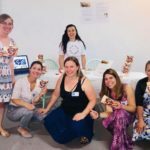 We invited female entrepreneurs an opportunity to showcase their businesses during our launch. We received an overwhelming response from dynamic business owners who needed a launching pad for a new concept as well as established businesses that were looking to grow their client base. 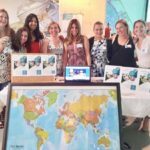 A special thank you to Rocket Yoga Arnhem, Arnhem Life, Over The Moon, Outfit Library Less, Spaans Activo, i2dfood, KinderCrea, Indu’s Kitchen and Postnatal Support Network for showcasing your talents and business. We believe your support only strengthened our success and we look forward to a long-term mutually beneficial partnership with you all. We had our excited community in attendance, as well as small businesses, however the support by members of the Gemeente Arnhem and Rheden was the final puzzle piece of what we needed to bring the community, business as well as local government together. 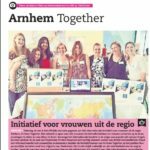 This is the ultimate objective of Arnhem Together – bringing women from all backgrounds and strengths together. To stimulate dialogue, and generate ideas so we can create opportunities that will benefit everybody. 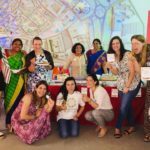 The women from the respective Gemeente’s thought our initiative was uplifting, positive and much needed by both international and local women. Indeed a great compliment…now please help us find some funding! The feedback we received after the launch was extremely encouraging. Your opinions and input are valuable to shape our future TOGETHER. Receiving mails like these just affirms that our organization is so needed in the city of Arnhem and surrounds! “It was a great event and we enjoyed it so much. Everything was very well organised. We had an amazing response to our stall and we are looking forward to do more things with you”. Keerthi – owner of @i2dfood. 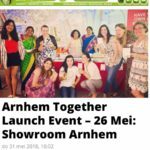 The local media even gave us a nod by featuring our event in the Arnhemse Koerier and Het Gemeente Nieuws. It was certainly a proud moment for the team. Thank you to our wonderful community for believing in us. 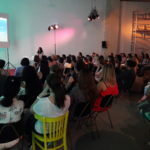 We are so grateful to each and every one of you incredible women who made the effort to attend and support us. We are excited and motivated to growing and strengthening our community together.